« What Makes Them Happy? When we bought our old fixer upper there was no mudroom. That is correct no mudroom. No coat closet. No dedicated laundry room. You just walked right in the house, mud and all, and traipsed around until your threw your coat on the floor and then stepped all over it with your dirty shoes. At least that is what my boys did. As a mother of six boys, I needed someplace for the mud. Or to at least give me the illusion that the mud and shoes would have a proper home of their own. And so we added one on. It seemed ridiculous to some people that we would buy a huge house that needed lots of work and then chose to put an addition on it the very first thing. It was the best thing we have ever spent money on. It is not a huge closet, but I knew in advance what I needed and wanted to store in it and so organized accordingly. I think sometimes when we look at magazines and closet organization websites, we are lead to believe that everyone has huge closets bigger than the bedrooms that most people sleep in. And that these closets are all professionally organized. Mostly I wanted it to be cheap and sturdy. I measured the closet and then hit my local home improvement mecca to figure out options. I ended up with the versatile Closetmaid organization system for the top shelf with the attached rod for hangers. It goes across the back wall of the closet and wraps around the right side. On the left side I bought inexpensive melamine shelves and cut them to length. I bought sturdy wire baskets from Kmart that were inexpensive and have held up for several years now even when they are turned upside down and used as step stools. Not that I condone such behavior, mind you. They are all labeled, one for each kid and then some extra ones. On the right hand side is a peg rack for the children to hang their coats, by themselves. The Frugal Duchess offers these tips on creating a closet that works for you and doesn’t break the bank. • Consider your finances. Professionally installed projects range from $300 to $15,000, according to Mort Malis, owner of the Miami franchise of California Closet. Pre-fabricated do-it-yourself shelves and closet materials from home supply stores are a budget option, says Efrain Machado, owner of Luv My Closet in Miami Beach. Although Machado sells closet units that can cost up $8,000, he has also created attractive solutions using trays, wicker baskets and decorative boxes priced from $5 to $14 at Target. • Sort and purge. Empty out your closet and make some ”hard decisions,” about each item, says Robertson of NAPO. Your give-away pile should include shopping mistakes, ill-fitting garments and worn out items, she says. Malis of California Closet says to discard or give away anything that you haven’t worn in the past 12 to 18 months. • Create groupings. Clothes and accessories should be organized by function and season. Rotate your seasonal items, with out-of-season clothes in the back and high-use items in the front. 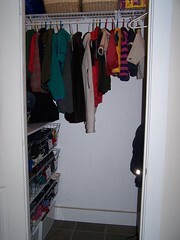 Store folded sweaters and T-shirts on open closet shelves. • Double Up. Use shelves and different levels of horizontal rods to create layers of space. • Discard wire hangers. In humid South Florida, metal hangers can leave rust stains. Opt for plastic, wood or fabric-covered hangers. All of these are great tips no matter what type of closet you are trying to organize. Especially the wire hangers. Don’t make me go all Joan Crawford on you. Shaunte, from This Too Shall Pass, illustrates perfectly why we all need to go through and purge our closets before organizing them. So I am going to try to de-clutter in there. I am starting with my belt collection. I am not sure why I even have them. I haven’t worn a belt since 1995, when I got pregnant with my first child. After that, belts became a mockery of my life when I actually had a waist. Still need some inspiration? On their website, Real Simple tackled six closets in the house of one family. The Carters urgently needed an intervention; Real Simple provided one, with problem-solving products, space-saving ideas, and no shortage of tough-love editing for every closet (pantry, hall, linen, bedroom) in their house. The easy-to-install, easy-on-the-wallet solutions shown on the following pages paid off big in improved accessibility, clutter control, and sanity (”No more kicking stuff out of the way!” Mark crows). With the proper application, they could well put your closets on the road to recovery, too. Everything that they did was practical and inexpensive. Have a look and see if you recognize yourself in the before photos. Then ask yourself, do you need a closet intervention? They not only show the before and after photos, love that, but provide links to all the products that they use. This entry was posted on Wednesday, August 29th, 2007 at 4:17 am	and is filed under Uncategorized. You can follow any responses to this entry through the RSS 2.0 feed. You can leave a response, or trackback from your own site. I am waiting to see how you orgainze your butler’s pantry. That is where I really need some help. We moved into a big ‘ole fixer-upper two years ago, and before fixing anything up, we are creating a mudroom. Thank you for the storage ideas. I am so dim, I just stare at the closet and can’t even visualize what would be the optimal way to shelve/hook/bin it, and just close the door and give up! We redid our master bedroom to get rid of some of the space in the bedroom, but give ourselves a good-sized closet. It is now one of my favorite rooms in our house. We purge all the time—I can’t stand to look at outdated or ill-fitting things. We don’t have a mudroom, although we often enter/exit via the basement (which opens into the garage), so that is our defacto mudroom. We do need to make the area more functional though. I can’t stand to think of all those wire hangers in the landfill. Which is one reason my closets are a mess - it’s hard for me to get rid of stuff unless I know it might be used. Regardless, a closet overhaul is a priority, starting with the doors. Thanks for the tips. Amen, Sistah! When we sold our 100-year-old fixer-upper and bought new construction, the mudroom was top on my list of priorities. These are great tips, but my issue is what to do with the baby bassinet that is taking up 90% of my closet and I have no where else to put it. She quit sleeping in it 8 months ago, but I can’t get rid of it. It’s a family piece (both my sister and I used it). Thanks for the mention. I am impressed with your closet and the six boys. On disadvantage to owning an old home (c. 1890) is the lack of closets. Whenever a room needs “re-doing”, the re-do requires a remodeled closet or storage space. It can frequently become hard to set apart the reliable intervention data from the bad….